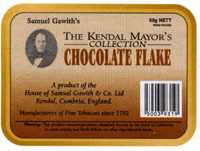 Buy Samuel Gawith Mayor's Collection Pipe Tobacco at cheap prices from Cigar Connoisseur, Specialist Tobacconis based in the UK, including Sam's Flake, St James's Flake, Westmoreland Mixture and Chocolate Flake are all made in the UK and are high quality. 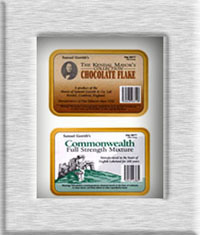 Sam's Flake is a blend of Virginia and Turkish tobaccos and pressed with a hint of sweetness - a delicious fresh smoke. Bright Virginias, Latakia and Black Cavendish blended and matured.